It’s was so hot today, and after spending most of the day in the sunshine at an outdoor event, promoting food waste recycling to local residents, I was glad to fit some wild time in at the end of the day. As the sun began to set we headed for our local badger sett. We’re members of Binfield Badger Group, who look after a badger sett which had a housing estate built around it back in the 1980s. Thanks to action by local people the badgers were saved from the development at that time and the group have been looking after the sett and the land around it ever since. There is a lot of development going in our local area at the moment, and there is concern that this will be bad for the badgers, as many of the nearby green areas, golf courses and fields where they would have been able to forage are being built on. For now though, there are still badgers living there. Popping between houses and opening the gate into the protected area around the sett, as we turned the corner to the lawn a grey bottom disappeared into the trees, a badger! We scattered food, peanut butter sandwiches, eggs and dried badger food and settled into the shed used as a hide to watch and wait. It was surprisingly quiet despite the late evening heat, not many people using the surrounding gardens. Peace, quiet, birdsong, unidentified rustlings in the trees. Staying still, finding a comfortable position to wait, quietly, anticipation building, hoping that tonight the wildlife will show themselves. Just before 10pm bursts of noise broke the silence, fireworks somewhere nearby, from a wedding or party, startling us out of our reverie. A little later, to the edge of our vision, a movement, a shadow against the darkness of the night, trotting into view a healthy glossy fox, brush tail erect, uncertain, sniffing at the food, grabbing an egg and dashing away. Then two foxes, one smaller, younger. Out from the bushes, grab some food, back into the bushes. 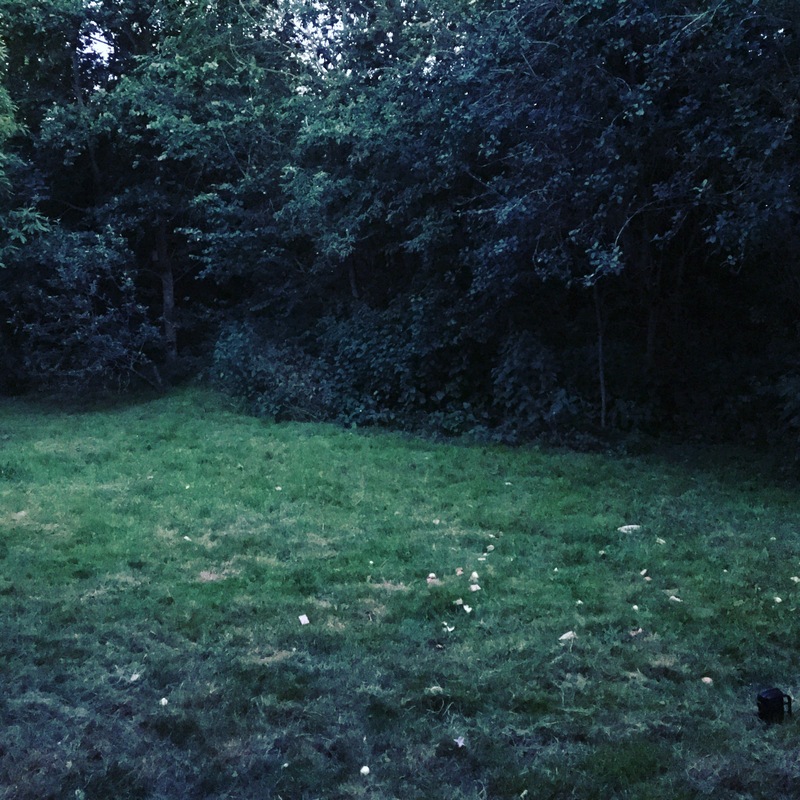 To the side of the lawn, an unearthly yowling, fox communication at its most raw, a sound to make your hackles rise, wildness. Anticipation built, the foxes were beautiful but we were on high alert. Finally a half hour after the foxes arrived, a larger, lower shadowy creature appeared, moving closer its black and white face became clear… a badger! At first hesitant, staying close to the bushes, snuffling, snatching food and running back into the bushes. A badger grabbing an egg is most comical, they look so pleased with themselves, trotting off, head held high, egg clasped gently in mouth, to crunch away out of sight. Other eggs we had cracked, so they broke as they were picked up, the badger lapping away at the spilled insides, crunching on the shell. The badger and foxes seemed unsure of each other. The larger fox was more wary, the badger charging at it a couple of times, stopping short, the fox slinking away into the trees. The younger fox was less fazed by the presence of the badger, an air of wary tolerance settled over the lawn, the badger and fox eating together in front of us, circling in and out of the trees, snacking on the food we had brought. The still warm night air made us drowsy, the effects of the hottest day of the year being felt, sleep creeping in, heads beginning to nod despite the excitement of the animals in front of us. A little after 1am, the animals retreated into the trees, a lull in activity, the signal for us to leave. Before we went we filled a dog bowl with fresh, cool water for the animals to enjoy. With the heat, wild animals will be thirsty, so it’s important to have water out and the perfect way to say thank you to them for such a lovely entertaining evening.